As I began, I could see the appeal these books had to my younger self: teenagers solving crime mysteries ahead of adults; the camaraderie of close friends; and encountering new technologies. The settings were exciting: I accompanied the boys around the bay near where they lived. And to far flung places. I didn’t remember most details. These were thrillers I enjoyed – I hadn’t thought too much while reading them. Re-reading brought new discoveries. One book I picked up felt too modern. I went digging. It turned out that many of the original series were revised. In school, we mostly had the older editions. The originals were written from 1927 onward, and after a while they received some criticism for racial and ethnic stereotyping. From 1959, the enterprise behind the books decided to bring out new versions: some were edited down while others entirely rewritten. Finding a few original texts, I did some comparing. The older versions somehow felt more interesting. While the main characters of these books were white, there had been some minority characters. They tended to be drawn cartoonish – with unattractive faces and thick accents. Foreigners came off as suspicious. The strategy behind the revisions dealing with stereotypes was to remove dialect and eliminate most of the diversity. The original protagonists also felt less polished. They had an ambivalent attitude towards the police. In the newer revisions, the youth were made more law-abiding. The older Nancy Drew carried a gun; the later version drove within the speed limit. But it was the class aspect that stood out the sharpest, in both old and new. The Hardy and Drew families belonged to the elite of their towns. The boys had cars and boats. When they traveled around the country, they were never short of cash. And there was a tendency to look down on people who were not well off. Whether my teenage self noted these details I cannot remember. America was a distant place and I knew it was not just home to whites; but I didn’t stop to think much about a world where society was divided between upright bourgeois and dastardly criminals. I doubt I read these books as realism. They were adventure stories set in a far off exotic place. The picture of America I received would soon be complicated through what I read in the news, and once I arrived in America, I faced a society quite unlike the world of The Hardy Boys. I hadn’t expected it to be. But how did a black boy or girl, say in Detroit, react to such books? The world of juvenile literature was populated by white privileged people and children who were black or Latino or working class could not see themselves there. In the absence of anything else, they might have read the series books – but what did they feel when they lived in the same country as the Hardy brothers or Nancy Drew and never saw themselves reflected as active characters? In distant Dhaka, I could ignore questions of detail but I doubt they could be so easily in Detroit. I made another surprising discovery. 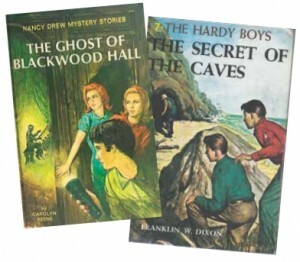 The authors of these books, Franklin W. Dixon or Carolyn Keene, were not real people. They were not even pseudonyms of real people. They were brand names created by the Stratemeyer Syndicate. In the late 1800s, Edward Stratemeyer began writing what were called dime novels (stories sold as booklets for 10 cents) and he worked with the author Horatio Alger. As education spread, the demand for popular fiction exploded. In 1906 he founded his Syndicate and farmed out the writing to others. He may have been inspired by Alexandre Dumas who published around 650 books. Dumas hired dozens of assistants and Stratemeyer followed mass production methods. He provided his crew with plot outlines, set deadlines, and paid standard rates. When he died in 1934, Fortune magazine noted, “Oil had its Rockefeller, literature had its Stratemeyer.” This Fiction Factory was immensely successful, both when it worked under Stratemeyer and his daughters and later after it was swallowed up by publishers. Some of the key series are still being churned out, and tens of millions of books have been sold. There are other fiction factories, and Bangladesh too can claim at least one. Sheba Prokashoni began in the mid-60s. Qazi Anwar Husain started the publishing house, writing detective and spy books like Kuwasha and Masud Rana. They proved so popular that he could not keep up with the demand. His name remained on many covers, but other writers were contracted to do the writing. Sheba came up with its own formula: transplant fiction. In this model, they take plots from Western thrillers and process them through Bangladeshi characters and settings. Some books combine plot elements from multiple books. Sheba too has provided a wealth of reading to young readers, and to date there are over 400 Masud Rana books. In both the U.S. and Bangladesh, such juvenile literature has often been condemned by adults. The Boy Scouts of America campaigned against the Stratemeyer Syndicate. Librarians and teachers have looked down at the books. They find the books to be low-brow, meant to arouse cheap thrills. In Bangladesh there is a prejudice against ‘out’ books, books outside the school curriculum. It was fun traveling back in time and rediscover where my lifelong reading addiction began. Now, onwards to something that suits my adult tastes. When I return to the library, I spot another Inspector Llob book from Yasmina Khadra.